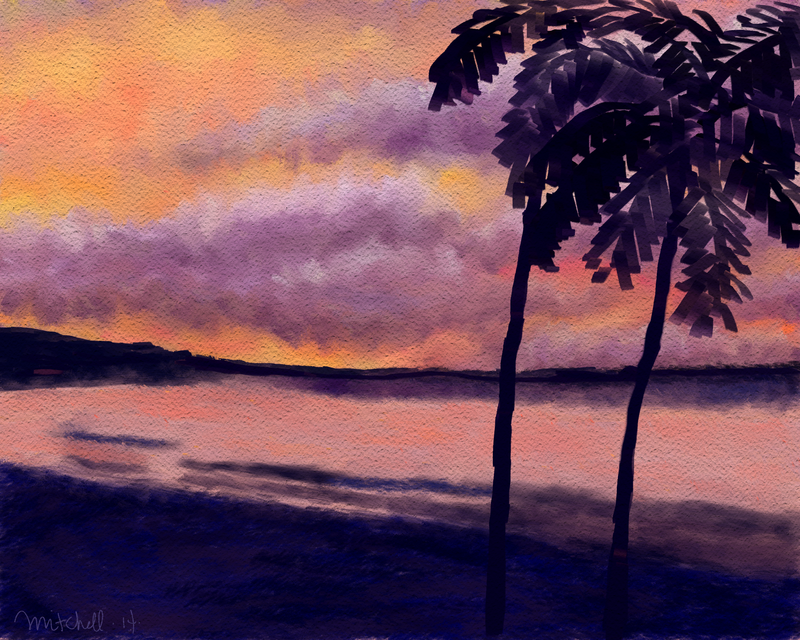 This pastel was done from a photograph I took from our lanai last November in Maui. I haven’t ever really done landscapes until recently. I really didn’t think I could draw one. But I’ve taken two classes on landscape art now, and amazingly, I’m doing them. They are so much fun. I am taking a class from Karen Bonaker at the Digital Art Academy. Karen made over 30 pastel brushes for us to use in our class. They are amazing brushes. They make marks just like various kinds of real pastels. One can use different paper textures to get different effects. These brushes were made to use a setting Painter has to paint with two colors at the same time. It is called Color Expression. Karen made these brushes so that when I press lightly, I get one color and as I press harder, a second color appears. This feature is just great. Many of Painter’s brushes can use this effect. I had played around with Painter’s pastels, but had become frustrated with them. Now, I have a great set of pastels. Anything about Painter, one definitely wants to check out Karen Bonaker’s blog. It appears Karen just set up a new blog site. Go there for information on Painter, as well as free brushes for Painter and many other goodies for Painter. You can buy these pastel brushes for a very reasonable $2.00. You can check out Karen’s You Tube Channel here. I plan on taking more landscape-type classes at DAA. They are reasonably priced and a lot of fun. Hi Leigh, I’m so glad you like this. It is the view from our lanai last year.